This will just be a short note with similar graphs as last time, only for a few of the major European nations. Sweden continues to generally improve. Note that in terms of top thirty performances, Norway has steadily declined over the years, but not among the top ten or better level. So they’ve become somewhat less deep of a team, but they still manage to crank out top results. Indeed, if anything they’ve been improving. After a couple stronger seasons, the Russian men aren’t off to a great start so far this season. 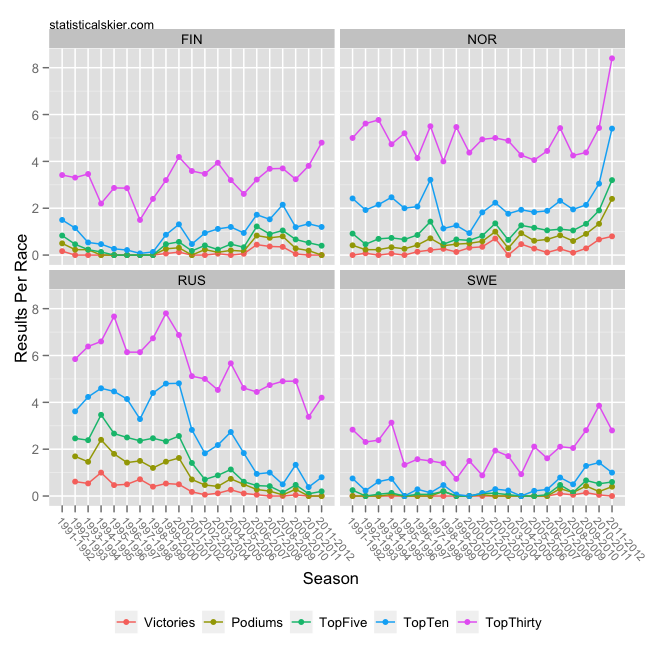 Some more dramatic trends are at play for the women’s distance events. Recall that a while back I was asked about whether the Norwegian women’s dominant performance so far this season is unprecedented and I answered “No”. I had sort of misunderstood the question to mean unprecedented compared to any other nation, but relative to Norway’s history it did appear fairly unusual. This would seem to suggest that the Norwegian women are indeed doing something they have never done before. After a bit of an off year last year, the Russian men seem to be sprinting a bit better again. Otherwise, things seem fairly stable, with the exception of the Swedish men, perhaps. More evidence of a strong resurgence for the Norweigan women women here, and a fairly large drop off in top 30 results among the Swedish women. Posted by Joran on Wednesday, December 28, 2011, at 6:00 am. Filed under Analysis, Cross Country. 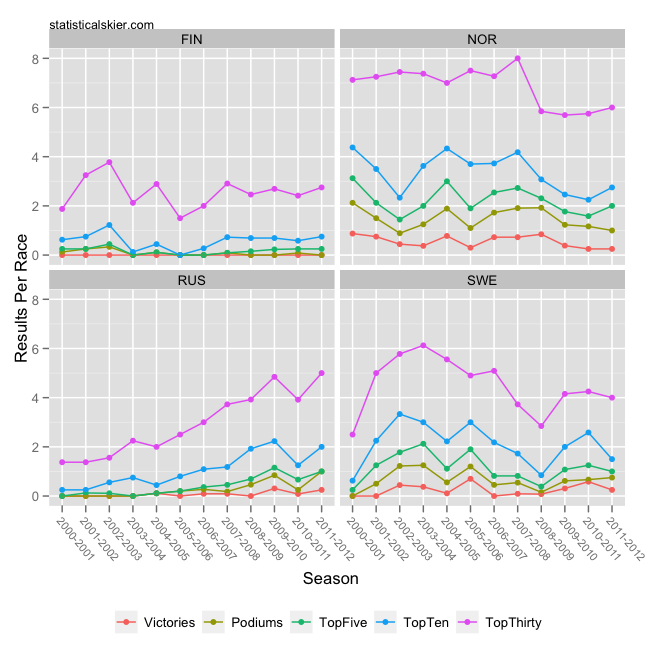 Tagged Distance, finland, men, midseason, norway, recap, russia, Sprint, sweden, women, World Cup. Follow any responses to this post with its comments RSS feed. You can post a comment or trackback from your blog.